Thomas & Betts Red Dot® Thomas And Betts Red Dot 1-Gang Universal weather-proof receptacle cover is suitable for use in wet locations with cover closed. The cover has a dimension of 4.75-Inch x 3.130-Inch x 1.224-Inch. 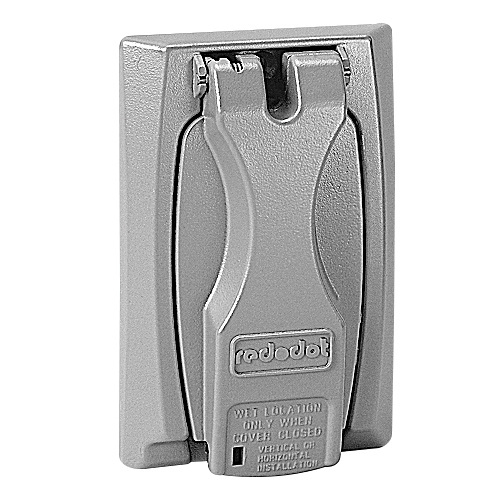 The flip-lid cover in bronze color, has die-cast zinc construction and is preconfigured for GFCI for common outdoor application. It has adapter plates that offer 12 installation options with 1-Gang cover and 25 installation options with 2-Gang cover. Cover is UL listed.